Minecraft: Story Mode, the game created by Telltale Games that lets players make decisions in the Minecraft universe and guide their way through a story, is now on Netflix. Released now and able to be streamed through Netflix, the episodic story from Telltale currently has three different episodes on the streaming service that viewers can interact with while watching the events unfold. “The Order of the Stone,” “Assembly Required,” and “The Last Place You Look” are the three available episodes that feature voice talents from actors and actresses such as Patton Oswalt, Catherine Taber, Sean Astin, and Melissa Hutchison. The trailer above was released years ago for the non-Netflix version of the game, and the Netflix trailer seen on the official site features a few changes, but the MineCon 2015 trailer gives an idea of what to expect from the series that’s now on Netflix. By using whatever device players have chosen to assist them when streaming the interactive experience, players can make choices while following the on-screen prompts to determine how the events will play out. Netflix’s page for the series said the final two episodes would be coming in December to round out the five-episode experience. 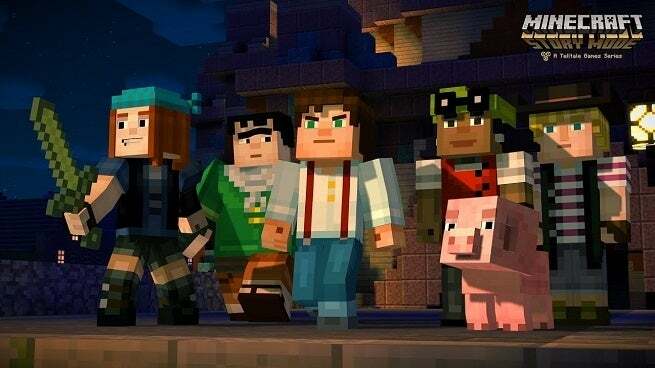 The emergence of Minecraft: Story Mode on Netflix’s streaming platform was announced earlier in the year when both Netflix and Telltale Games confirmed its arrival would happen at some point in 2018. While those statements ring true now that it’s available to be streamed, there was some uncertainty regarding whether it would actually come to Netflix following the issues involving Telltale Games that consisted of mass layoffs and seemed to put the rest of the studio’s projects in peril. The topic of Minecraft: Story Mode was addressed during the discussions though with Netflix commenting on the news of Telltale Games’ troubles while still saying plans to bring the Minecraft experience to the service were moving forward. Three of the five episode of Minecraft: The Story Mode are now available to stream on Netflix with more coming next month.